Multiengine aircraft typically fly faster, higher, and farther than single engine aircraft. Multiengine aircraft are designed for added safety and redundancy and, therefore, often contain a more complex power distribution system when compared to light single-engine aircraft. With two engines, these aircraft can drive two alternators (or generators) that supply current to the various loads of the aircraft. The electrical distribution bus system is also divided into two or more systems. These bus systems are typically connected through a series of circuit protectors, diodes, and relays. The bus system is designed to create a power distribution system that is extremely reliable by supplying current to most loads through more than one source. Since two alternators (or generators) are used on twin engine aircraft, it becomes vital to ensure both alternators share the electrical load equally. 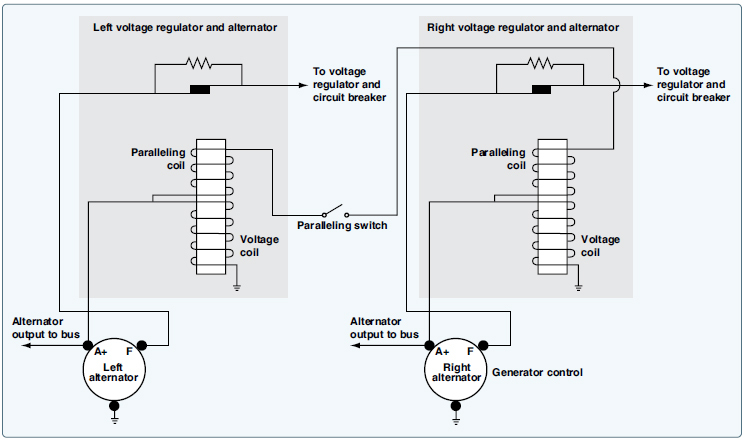 This process of equalizing alternator outputs is often called paralleling. In general, paralleling is a simple process when dealing with DC power systems found on light aircraft. If both alternators are connected to the same load bus and both alternators produce the same output voltage, the alternators share the load equally. Therefore, the paralleling systems must ensure both power producers maintain system voltage within a few tenths of a volt. For most twin-engine aircraft, the voltage would be between 26.5-volt and 28-volt DC with the alternators operating. A simple vibrating point system used for paralleling alternators is found in Figure 1. 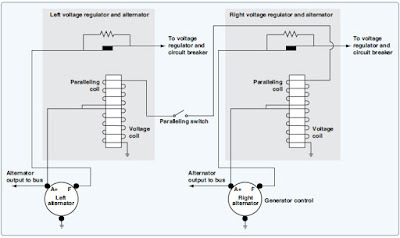 As can be seen in Figure 1, both left and right voltage regulators contain a paralleling coil connected to the output of each alternator. This paralleling coil works in conjunction with the voltage coil of the regulator to ensure proper alternator output. The paralleling coils are wired in series between the output terminals of both alternators. Therefore, if the two alternators provide equal voltages, the paralleling coil has no effect. If one alternator has a higher voltage output, the paralleling coils create the appropriate magnetic force to open/close the contact points, controlling field current and control alternator output. Today’s aircraft employ solid-state control circuits to ensure proper paralleling of the alternators. Older aircraft use vibrating point voltage regulators or carbon-pile regulators to monitor and control alternator output. For the most part, all carbon-pile regulators have been replaced except on historic aircraft. Many aircraft still maintain a vibrating point system, although these systems are no longer being used on contemporary aircraft. 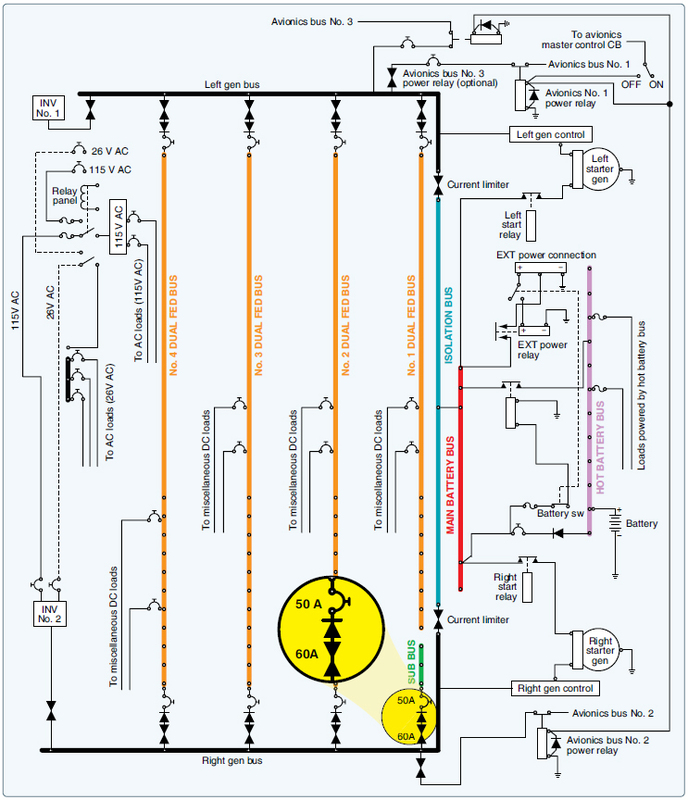 The power distribution systems found on modern multiengine aircraft contain several distribution points (busses) and a variety of control and protection components to ensure the reliability of electrical power. As aircraft employ more electronics to perform various tasks, the electrical power systems becomes more complex and more reliable. One means to increase reliability is to ensure more than one power source can be used to power any given load. Another important design concept is to supply critical electrical loads from more than one bus. Twin-engine aircraft, such as a typical corporate jet or commuter aircraft, have two DC generators; they also have multiple distribution busses fed from each generator. Figure 2 shows a simplified diagram of the power distribution system for a twin-engine turboprop aircraft. This aircraft contains two starter generator units used to start the engines and generate DC electrical power. The system is typically defined as a split-bus power distribution system since there is a left and right generator bus that splits (shares) the electrical loads by connecting to each sub-bus through a diode and current limiter. The generators are operated in parallel and equally carry the loads. The primary power supplied for this aircraft is DC, although small amounts of AC are supplied by two inverters. The aircraft diagram shows the AC power distribution at the top and mid left side of the diagram. One inverter is used for main AC power and the second operated in standby and ready as a backup. Both inverters produce 26-volt AC and 115-volt AC. There is an inverter select relay operated by a pilot controlled switch used to choose which inverter is active. The hot battery bus (right side of Figure 2) shows a direct connection to the aircraft battery. This bus is always hot if there is a charged battery in the aircraft. Items powered by this bus may include some basics like the entry door lighting and the aircraft clock, which should always have power available. Other items on this bus would be critical to flight safety, such as fire extinguishers, fuel shut offs, and fuel pumps. During a massive system failure, the hot battery bus is the last bus on the aircraft that should fail. If the battery switch is closed and the battery relay activated, battery power is connected to the main battery bus and the isolation bus. The main battery bus carries current for engine starts and external power. So the main battery bus must be large enough to carry the heaviest current loads of the aircraft. It is logical to place this bus as close as practical to the battery and starters and to ensure the bus is well protected from shorts to ground. The isolation bus connects to the left and right busses and receives power whenever the main battery bus is energized. The isolation bus connects output of the left and right generators in parallel. The output of the two generators is then sent to the loads through additional busses. The generator busses are connected to the isolation bus through a fuse known as a current limiter. Current limiters are high amperage fuses that isolate busses if a short circuit occurs. There are several current limiters used in this system for protection between busses. As can be seen in Figure 2, a current limiter symbol looks like two triangles pointed toward each other. The current limiter between the isolation bus and the main generator busses are rated at 325 amps and can only be replaced on the ground. Most current limiters are designed for ground replacement only and only after the malfunction that caused the excess current draw is repaired. The left and right DC generators are connected to their respective main generator busses. Each generator feeds its respective bus, and since the busses are connected under normal circumstances, the generators operate in parallel. Both generators feed all loads together. If one generator fails or a current limiter opens, the generators can operate independently. This design allows for redundancy in the event of failure and provides battery backup in the event of a dual generator failure. In the center of Figure 2 are four dual-feed electrical busses. These busses are considered dual-feed since they receive power from both the left and right generator busses. If a fault occurs, either generator bus can power any or all loads on a dual-feed bus. During the design phase of the aircraft, the electrical loads must be evenly distributed between each of the dual-feed busses. It is also important to power redundant systems from different busses. For example, the pilot’s windshield heat would be powered by a different bus from the one that powers the copilot’s windshield heat. If one bus fails, at least one windshield heat continues to work properly, and the aircraft can be landed safely in icing conditions. The current can flow from the generator bus to the dual-feed bus, but the current cannot flow from the dual fed bus to the main generator bus. The diode is placed in the circuit so the main bus must be more positive than the sub bus for current flow. This circuit also contains a current limiter and a circuit breaker. The circuit breaker is located on the flight deck and can be reset by the pilot. The current limiter can only be replaced on the ground by a technician. The circuit breaker is rated at a slightly lower current value than the current limiter; therefore, the circuit breaker should open if a current overload exists. If the circuit breaker fails to open, the current limiter provides backup protection and disconnects the circuit.